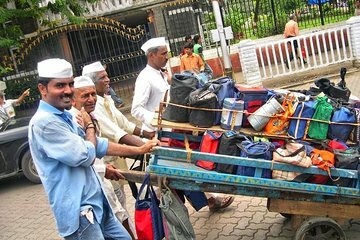 Mumbai è una delle città più vivaci e multiculturali dell'India, ma i visitatori per la prima volta spesso vedono solo le attrazioni principali. Questo tour di 4 ore in piccoli gruppi ti darà un'idea della vita reale di Mumbai, mentre sali su un treno locale, visita un tradizionale mercato dei fiori, assaggi i tipici snack indiani e ammiri monumenti come la Porta dell'India e l'Hotel Taj Mahal Palazzo. This trip was exactly as advertised. We were met promptly by Ganesh, our guide, outside the Regal cinema. He was a very informative guide who made the tour thoroughly enjoyable. Travelling on public transport was easy with him there to lead and buy tickets and the train journeys we took were not too busy - no fear of having to push or hang on. Great! This tour was amazing, Ganesh our tour guide was on time and was very knowable on the information he gave us. It was nice to interact with the locals wile we took public buses and the train. Our group was very smal and we enjoyed very much. Very good guide, reasonable price. Enjoyed the experience of going on a bus and 2 local trains, and seeing local sites. Tour was one on one. Tour was on Sunday so we didn't see some sites, but trains were much less crowded. Guide was careful to give me directions to my next tour.